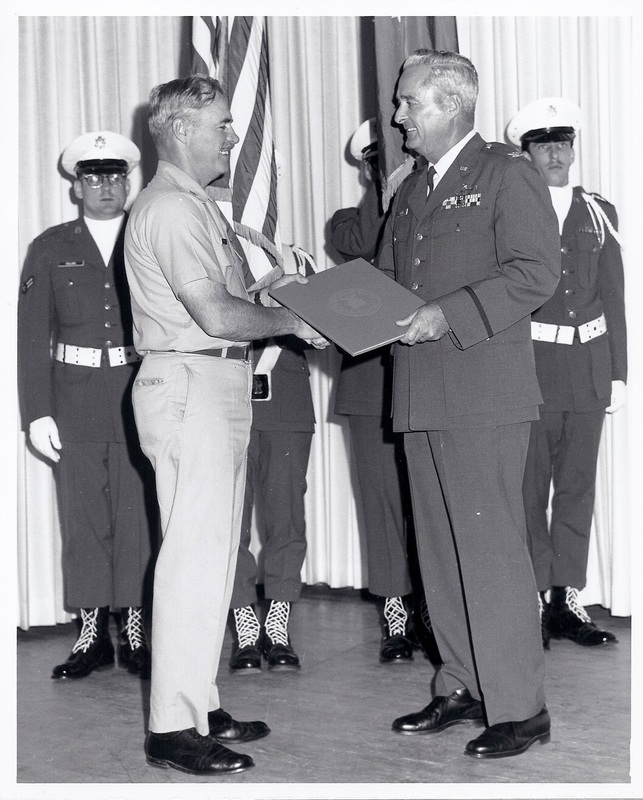 Operation Chromedome was a top secret military exercise conducted in the late 1950s and early 1960s. It evolved as the “Cold War” heated and cooled, but seemed to always remain. 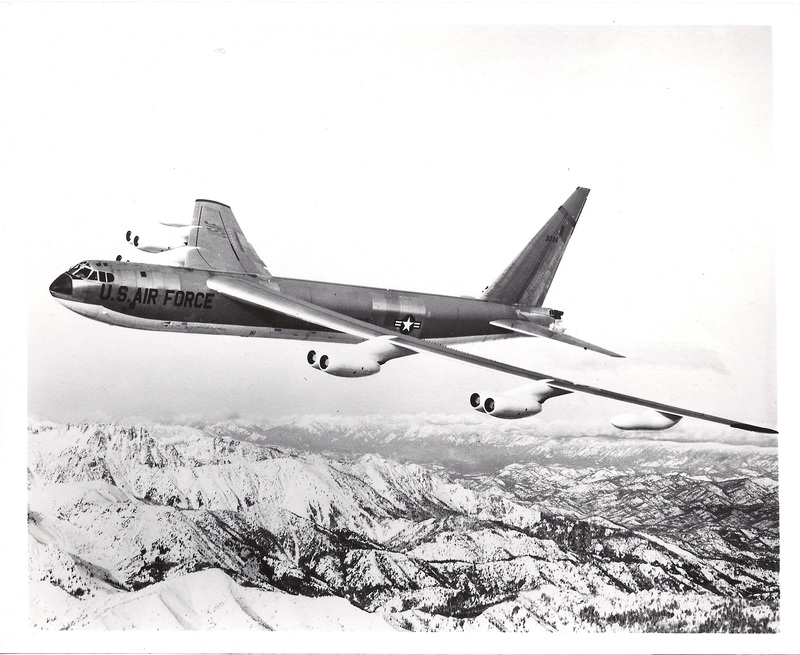 It involved our country’s newest bomber, the Boeing B-52 and both Boeing aerial tankers, the older KC-97 and the new KC-135. 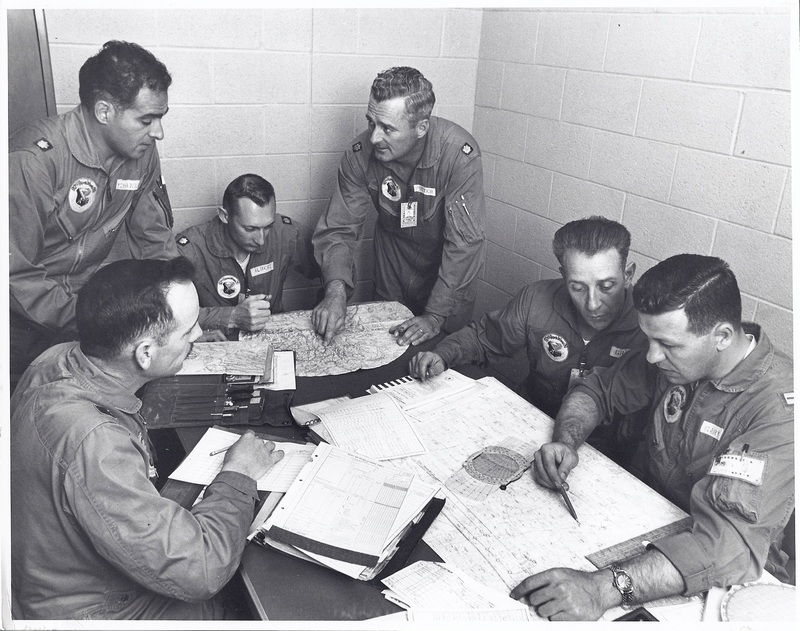 In addition to the flight crews there were a great number of support personnel required for a mission this complex to succeed. The concept was to keep a given number of bombers airborne around the clock, day in and day out. They would carry a full load of nuclear weapons, missiles, and the top secret information needed to depart at any point on a mission to retaliate or to counter any threat. It took a command from the President of the United States to launch these aircraft on a strike, since nuclear weapons were involved. What follows are my recollections of this exercise and the build up of world tensions that made it necessary. During World War 11 we were allies with the Russians. Hitler had invaded their country and the loss of life on both sides was horrendous. The Russians had undergone the overthrow of the Czar’s in the 20s and their country had continued to be in disarray. The period prior to the war saw a lot of internal conflicts with the different political factions vying for power. Their industries were poor, inefficient, and produced a poor product. Because of this, the US supplied them with much of the necessities of their war with Germany. We supplied thousands of tanks, 409,526 trucks, tens of thousands of jeeps, many planes, and nearly 5,000 ships. In addition, enough cloth to make 54 million uniforms along with $1.5 million-worth of buttons, and 14.5 million pair of military boots were also shipped. Canned pork as well as SPAM, a new product produced during the war, was sent over by the tons. We provided them with literally millions of cans of Spam. With out this help, Russia would most likely have been defeated almost as easily as were the other countries attacked by Germany. But as this war was drawing to a close, with Russian and Allied troops both inside Germany, it was agreed that the “honor” of “taking” Berlin, should go to the Russians. They had the largest loss of life of any country with 7.5 million military and 10 million civilians deaths. The honor of occupying the enemies’ capitol was in recognition of this. Our armies were held outside Berlin near the Elbe river, while Russian troops overran the city. The agreement was that the Allies would come in after the official surrender. But it did not work that way. Russia would not allow the Allies entry for several weeks. During this time they dismantled all the machinery, rolling stock, vehicles etc. they could find and sent them home to Russia. Whole factories, workers included were shipped to Russia. These were early indications that Russia would be difficult to work with. As war ended in 1945, things did not get any better. Germany was divided, as was Berlin. The infamous Berlin wall was put up, effectively dividing the city. It had a “no man’s land” along the wall where quite a number of east Germans were shot trying to cross. There was Check point “Charlie” the only pass through point between the two Berlins. This was always a sore spot and lots of incidents had their beginnings here. There was friction between both sides constantly. In 1948 Stalin ordered all truck, rail and water traffic in and out of Berlin stopped. His plan was to starve the people and leave the Allies with no way of supplying their troops in Berlin. He hoped to force the allies to leave the city. This resulted in the Berlin Airlift which lasted until May of 1949 when the Russians again reopened the canals, rails and roads. All this led to tension and distrust between Russia and the western countries. Churchill coined the phrase the “Cold War.” to describe the feelings. Even as early as 1949, no one completely ruled out the possibility of going to war with Russia. The one thing that made this improbable was that we had the atom bomb. They did not. Our scientist thought it would take them from 10 to 20 years to develop one themselves. But with the aid of spies and traitors such as the Rosenbergs, Fuchs and others, they were able to provide a nuclear explosion as early as late 1949. Bombs would quickly follow. The Russians were riding high in the late 50s and 60s, they launched Sputnik, the first man made object to orbit the earth in Oct. 1957. They landed a satellite on the moon in 1959, the same year they developed their intercontinental missiles. In May 1960 they launched a 4.5 ton space craft into orbit and shot down Gary Powers, both in the same month. In 1961, Yori Gagarin became the first human to orbit the earth. April 17th of that year we were involved in the Cuban Bay of Pigs fiasco. Oct. 1962 found missiles in Cuba, with the naval blockade ordered Oct. 22, 1962. The cold war was a real, constant and everyday threat during the 50s, the 60s and into the 70s. 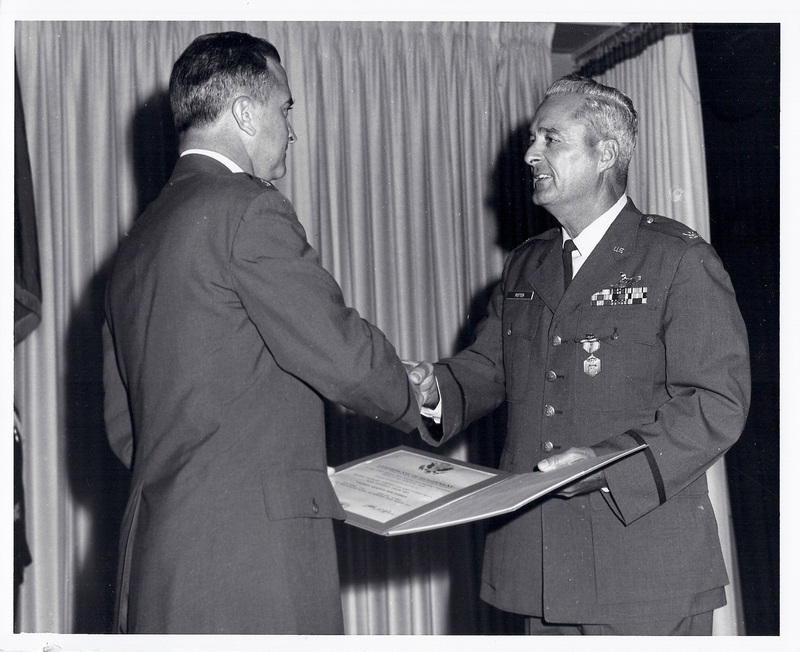 During this time I was assigned to the Strategic Air Command, the part of our military force most responsible for delivering nuclear bombs. This is why we deployed to “forward” positions, Guam, England etc., to be nearer Russia in the event war did develop. It was impossible to bomb them from the US, and the plan was to saturate them with nuclear weapons. Also at this time the intercontinental missiles were being developed by both sides. With missiles available, the navy produced submarines able to handle and deliver nuclear armed missiles from under water. The George Washington, the first ballistic missile submarine, was launched at Groton Conn. on June 9, 1959. The first tests of an underwater submarine launch came in July 1960. Other subs followed, joining the “triad” as it was called, airborne delivery, missile delivery and underwater delivery. A target system was developed with all possible potential targets listed with bombs or missiles and in many cases both, assigned to them. This was known as the SIOP. Single Integrated Operations Plan. So this was the thinking and the way things were, when the B-52 came into operation in 1955. Our wing got them in 1957. I upgraded to instructor status in 1958. About this time, we commenced the ground alert system that was to last over three decades. A portion of our aircraft with bombs, ammunition, chaff and all items required for going to war, would be made ready and put in a secure guarded area on base. These areas were near the take off end of the runway. Crews were assigned to each plane, were briefed on their targets and spent from three to seven days nearby. We would have practice “launches” both day and night. The klaxon would sound, a loud clattering noise that always made me jump. We’d race to the aircraft, start engines and prepare to taxi, never knowing if this was the “real thing” or not. When the klaxon sounded, a series of red rotating lights would go on, all over the base. All vehicular traffic, except alert crews, were instructed to pull off the roadway, and remain stopped as long as the lights rotated. I think they were set for fifteen minutes. If the alert came while we were on base but temporarily away from our alert quarters, we were permitted, in our alert vehicle, to ignore stop signs, red lights, right of way and speed limits going to the aircraft. We had pre-planned routes from the areas on base we were permitted to visit, so could really burn rubber getting there. Sgt. Green, our gunner, drove. He’d slow up near the aircraft nose, the five of us would pile out, leaving the doors open, he’d run the car to the back of the aircraft, just off the parking pad, turn off the key and abandon it. All he had to do was be aboard when we taxied. I never heard of any gunner missing getting aboard in time. The message would come over the radio in code. Our EWO officer was primary to receive and write down this message, with two others required to “authenticate” it. You could receive just a start engines test, or one where you would taxi to the runway and simulate taking off by rushing down the runway but staying on the ground. And of course, there was always the possibility of getting the “real” one, sending you either to war, or en route to war awaiting another message. This type of message was never sent. After each exercise, the fuel tanks were topped off and the aircraft parked and returned to a ready condition. During these periods of alerts, we’d have our brief cases with the plane’s operating manuals aboard, all our target materials, our extra flying gear, lunches etc. We had our helmets at our stations, oxygen hooked up and our check list open. We would pre-set many switches, so that as soon as we hit the seat, we could initiate engine start, while still hooking up the parachutes. We’d start one engine using compressed air, run it up to 90% power and start the other seven simultaneously. It was a eyeful watching all the gauges, trying to be sure you did not get an over heat or other problem. We’d start taxing while finishing the check list items. You could “steer” the plane with the rudder pedals, leaving your hands free to finish up other things. We would be at the end of the runway, ready for take off in never more than five minutes. If we were close to the aircraft when the alarm sounded it could be in less than three. Adrenalin really ran heavy. Later the aircraft were modified so that we had a “cartridge” start capability on two engines, one on each wing. When you ignited these cartridges, they produced a great volume of air (and smoke) which ran the engine starters. We would start one engine on each wing, then the remainder. This shaved a few seconds off the “get ready” time. The intercontinental missiles were a threat reality by now, with their flight time from Russia to the US less than 30 minutes. Any aircraft on the ground after that was a liability and considered lost. We had many Operational Readiness Tests, conducted by higher headquarters. These tests simulated going to war and would require getting all aircraft loaded and ready to fly. We then would take off and fly a pre-planned route. Most of these were flown with no weapons on board. 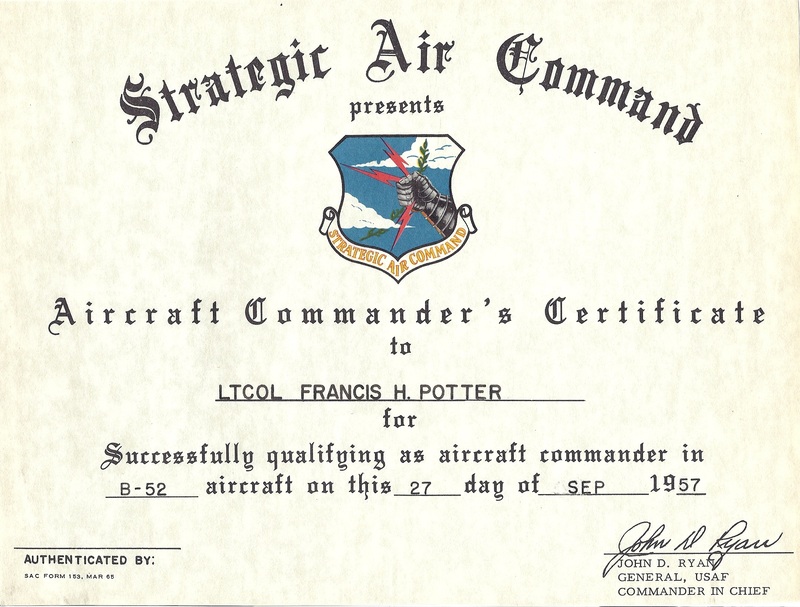 I guess in the course of my career, I probably had real weapons aboard three or four times, other than during the airborne alert missions. Dummy weapons we carried several times. On many of these tests we’d have evaluators riding along with us. I’ve had many such passengers, and never had a problem with them. 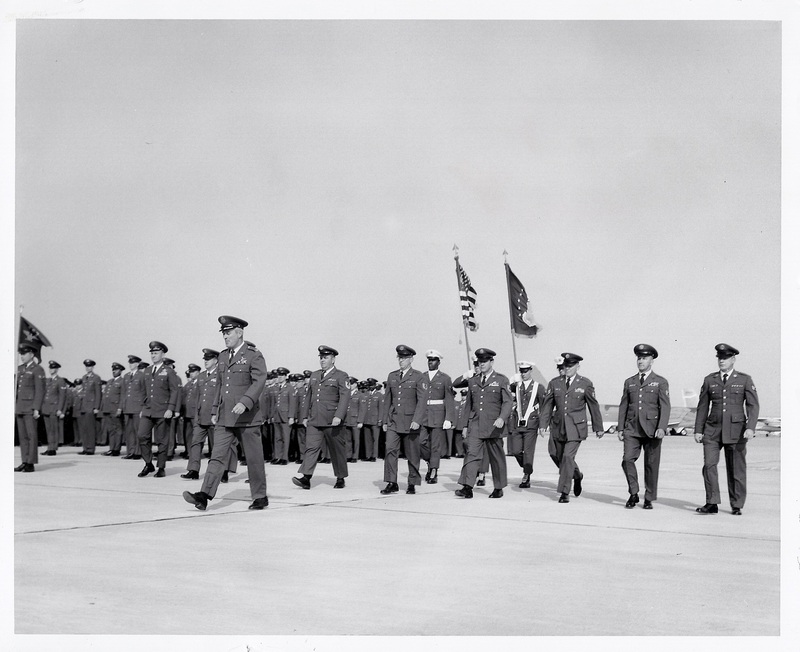 In early 1959, higher headquarters began to wonder if a constant airborne alert could be maintained. It would involve a certain number of planes, all loaded as if going to war, to be airborne all the time. Our wing was given the job of running a test to check the feasibility. We had three squadrons at Fairchild, with some 18-20 planes per squadron. By now we had the DEW (Defence Early Warning) system installed. It used very large antennas set to detect a missile launch from Russia. The line, as it was called, started in the vicinity of Nome, Alaska and covered the entire northern exposure of north America. It was manned and operated primarily by civilians. Since this was such remote duty, they were on duty for a two week period, then brought home for a similar time. During the cold war, there was a hitch or two in the DEW system. They made one identification of a supposed mass launch of missiles. Common sense dictated that such a large launch was not probable, so it was “watched.” It proved to be a magnetic disturbance of some kind. Had it been a smaller launch, we’d have been airborne. In March 1959, operation Headstart became a reality. We would fly a route staying in the western US and up toward Alaska and back the entire time. 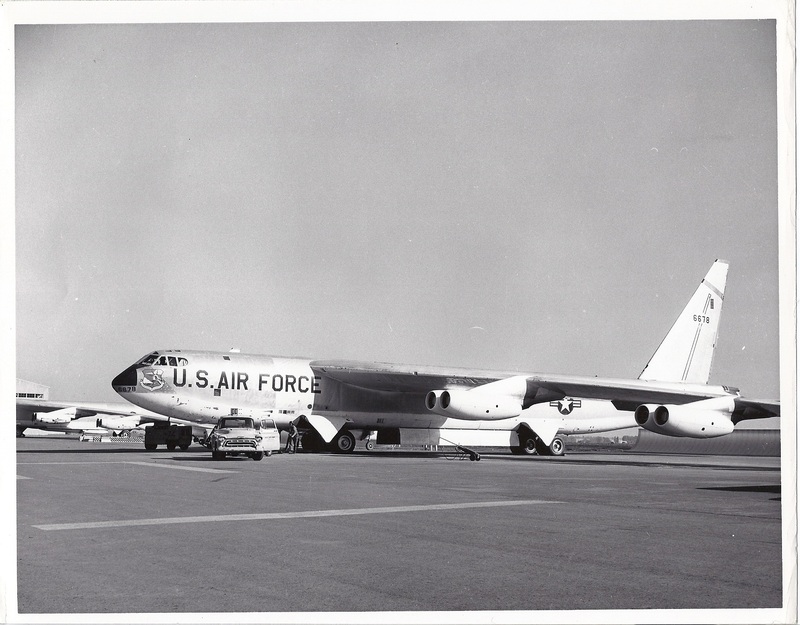 We had one refueling with this operation, using the Boeing KC-97’s which would extend our flying time to 20-22 hours. We had to come back to this area for refueling, so the tankers could give us a maximum off load and be able to land back at Malmstrom AFB, Mt. These flights went fairly well, except for the refueling. 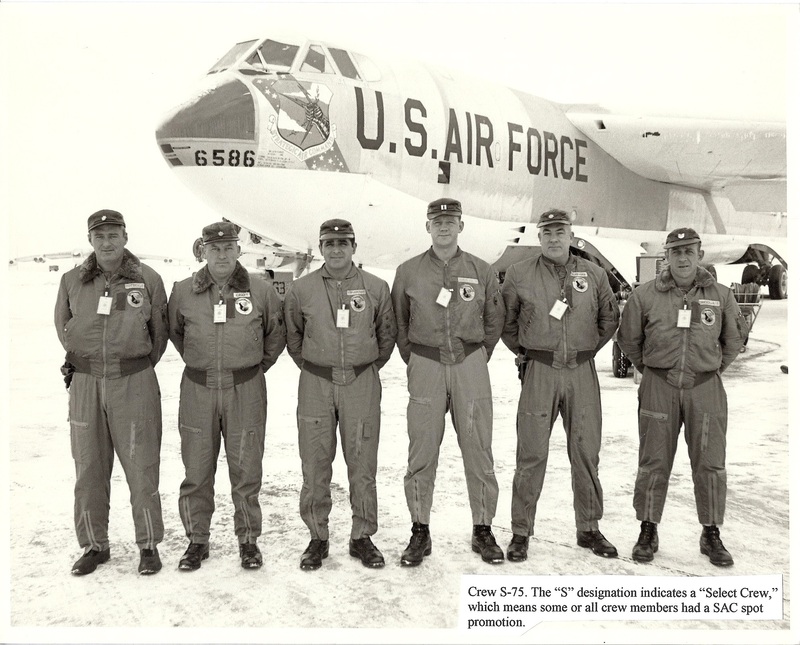 To use the KC-97s we had to descend to around 16-18,000 ft. Very often this put us right in the clouds and turbulence. We’d make radar and radio contact with the tanker. When we were 50 miles out, the tanker would depart on refueling course. We’d start our descent at 12 miles arriving behind the tanker and 500ft. low. At 4 miles we’d have 275kts, 3 miles 250, 2 miles 225, and at one mile our refueling speed of from 210 to 220kts. Altitude and tanker weight would determine this. Having to use this low an airspeed made us wallow a lot. Getting all your fuel could be a chore. 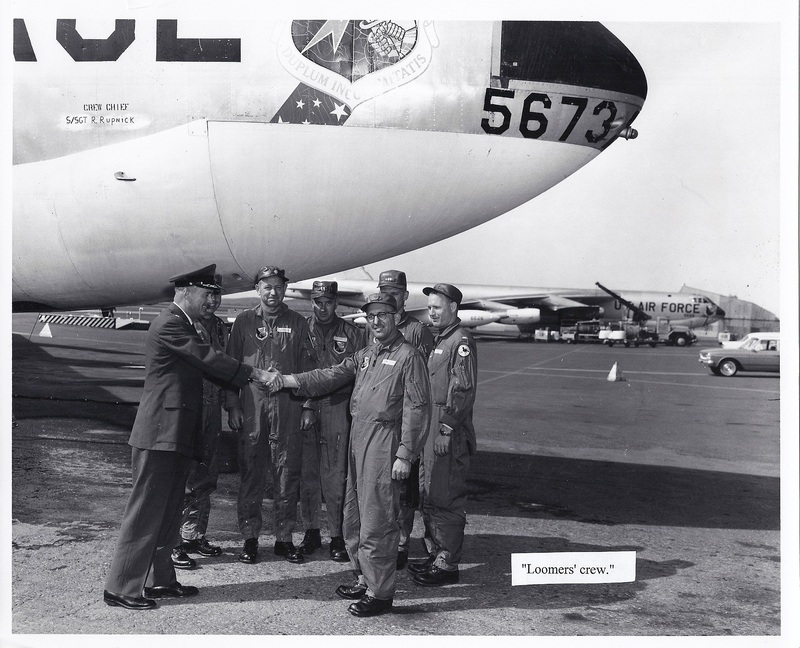 The KC-97 would transfer fuel at 5000lbs. per minute. I remember one night, Col. Miller, the Wing Commander, was along. We met our tanker, but for some reason we had a problem with the boom “latches”. These are the “fingers” that grabbed the boom and held it inserted into our receptacle. We tried several times, but the boom would make contact then jump right back out. Without getting fuel, we’d have to land early. This would reflect on the wings readiness capability. Knowing the mission was important, I asked the boom operator to “go to a stiff boom.” By keeping hydraulic pressure on the extendible portion of the boom, he could keep it extended. I told him I’d ease into position and try to maintain enough pressure to stay in contact, and for him to start the fuel transfer as quick as he could. The tanker crew knew Col. Miller was with me, so didn’t fuss about trying it. We could have damaged or tore the boom off or caused some more serious problems, so it was not something we did all the time. To shorten a long story, we got our fuel. Probably took several trys, but we did it. The tanker went home, we went on our way. After it was all over Col. Miller, who had not said a word so far said, “That was great. I wonder why the rest of them can’t do things like that?” I responded with, “I’m sure they could if they’d just think of it.” I never heard any more about it. On these missions we would take off at, or near the maximum gross weight of 450,000 lbs. with a full fuel load of 270, 094 lbs. (41,553 gal.) On all missions, the last 20 minutes prior to take off were interesting. At about 20 minutes prior, we’d start engines. Using the normal check list, we’d get all systems running including the four electrical alternators which had to be synchronized and put “on the line.” That is, we fed the main power panel from all four. We’d be receiving our final route clearance about then which we had to acknowledge and read back. About 10 minutes prior to take off the tower would clear us to the take off end of the runway often with instructions to “hold short of the active.” If there was no traffic near by, they might clear us into “take off position and hold.” In any event, about 3-4 minutes prior to our scheduled take off time, we’d be cleared into position and cleared “to depart when ready” and also be given climb out instructions. Everyone would be on oxygen. The navigator would keep track of these last few minutes and give us a warning, “one minute to take-off.” At the 30 second point, he’d start a countdown, 30, 20, 15, 10, 5, 4, 3, 2, 1, and hack. At about twenty seconds we’d advance all eight engines to the predetermined take-off EPR (engine pressure ratio) setting. The old aircraft would really shake and vibrate, and the noise behind us was horrendous. This EPR setting would give maximum power for that day, considering altitude, temperature, dew point etc. We’d let the engines stabilize, adjust individually if needed, turn on the water injection switches, if being used, check for all eight of these lights to go out (on a panel left side of the AC) when they did, the navigator should be saying “hack.” The pilot making the take off would release the brakes and we’d surge forward. With all that power the plane seemed anxious to get going. We’d run our “go-no-go” check at the given time, usually around 20-25 seconds. The navigator would count down this time too. When he said the predetermined number, we’d check our air speed. For instance at 20 seconds we should have a minimum of say 100kts. This was to insure the plane was accelerating as it should, and that we would reach take-off speed prior to the end of the runway. It was also the last spot at which we could abort and be sure of having enough braking power to stop while still on the runway. With everything working right, we’d press on, air speed building up rapidly. At about 120 kts., the wing tips would come up, and we’d race on. At these weights, especially on a hot day, we’d need near 180-185 kts. to get airborne (about 210 mph) By then we’d have less than 3,000 feet of the 14,000 feet of runway left, and it comes at you pretty fast. But, having faith we’d press on, and at the predicted speed, the aircraft would lift off. We’d climb to 50 ft., depress the brakes to stop the wheels from rotating and retract the landing gear, set throttles to climb power, climb to 1,000 ft. and retract the flaps. As they retracted our airspeed would increase to 220 kts. when flaps were full up. We’d then accelerate to climb speed, 280 kts.. When we reached that speed we’d start our normal climb out. Water switches had to be turned off, allowing any remaining water to be expelled. At this speed, our rate of climb would be from 8 to 10,000 ft. per minute. As you got higher, into thinner air, this would slow down to perhaps 1500 ft./min. As we climbed out, at 12,000 ft. we’d call for an oxygen check and report on the cabin pressures to insure the pressurization system was working. About now we’d change radio frequencies and contacts along with IFF settings. At 24,000 feet we’d change our altimeters, going to a 29.92 (standard atmospheric) setting. Below that altitude you used the “station corrected setting.” By the time we got to this altitude, we’d usually be above any weather and the air would be fairly stable and smooth. We’d reach our assigned altitude, somewhere around 32-35,000 feet, get on the heading the navigator desired and engage the auto pilot. Usually, the EWO officer would bring us a cup of coffee about now. I always appreciated that. After take off from Fairchild, we went to a point near Missoula Mt. and orbited for about an hour. This was a “slack time” in the event you were late in taking off. This loiter time could vary. At the correct departure time, we’d continue the route across the US, going mostly east. We’d pass over Lake Michigan north of Chicago, where it is near its widest, 120 miles. It always surprised me how wide it really is. Then on to the Atlantic ocean just a bit north of New York City. It would be dark by now and I remember looking down at the glow of that large city. We’d go out from the Atlantic coast for about a hundred miles then turn north, northeast. Shortly then we’d meet up with a KC-135 from one of the bases in either Massachusetts or Maine. They’d give us an offload of around 135,000 lbs. of JP-4 jet fuel. One gallon weighs 5.4 pounds. For our purposes we dealt in pounds. When we finished the onload, we’d disconnect and they would return to their base, having been airborne for only an hour or so. We would have been airborne for some 8 or 9 hours by now. After filling our tanks, we set a course northeast for a while up past Nova Scotia, then pretty much north. We’d go up over Greenland, seeing the lights of Thule below the clouds, which were always there. On north past the Arctic Circle to our turn point. From there we would head south westerly, towards Pt. Barrow, Alaska. When nearing Pt. Barrow we set our course south, heading towards Fairbanks, Alaska. KC-135s from Eilson AFB at Fairbanks would take off and come north to meet us. We’d rendezvous with them a couple hundred miles to the north of their base. We’d hook up and by the time we’d complete taking on our 135,000 lbs. of fuel, often you could see the air base below and to our right. The tankers would peel off, head home and log their hour and a half flying time. They of course had to get ready to meet the next aircraft on the route. After leaving the tanker, we’d head back west, and go out to near Attu, on the Alaskan chain. Turn back south east and hit the coast near Juneau Alaska. From there it was just a couple hours further south and we’d end up at Fairchild. These missions would run from 24 to 24 1/2 hours. We flew this route by ourselves sometimes, with other ships following in an hour or more; other times we would fly in a three ship group, called a cell. The lead ship would do the navigation with the two following on it. The second ship would be one mile behind and 500 ft. above, the third ship would be the same position from the second ship. When we flew this formation, we would take off in one minute intervals, with the ships in front doing a dog-leg to give the second and third a chance to catch up. Since one tanker could not give enough off-load to satisfy two bombers, this would require a three ship tanker formation, with each bomber getting it’s own tanker. During the boring portions of the flight, we’d change lead ship ever so often, so the others could rest. With this much practise, two refuelings on each mission, taking on 135,000 pounds each time, we got pretty good. The tanker’s boom is about a four inch “hose.” I believe the transfer pressure was 65 psi. So we could take on the fuel in eleven or twelve minutes. 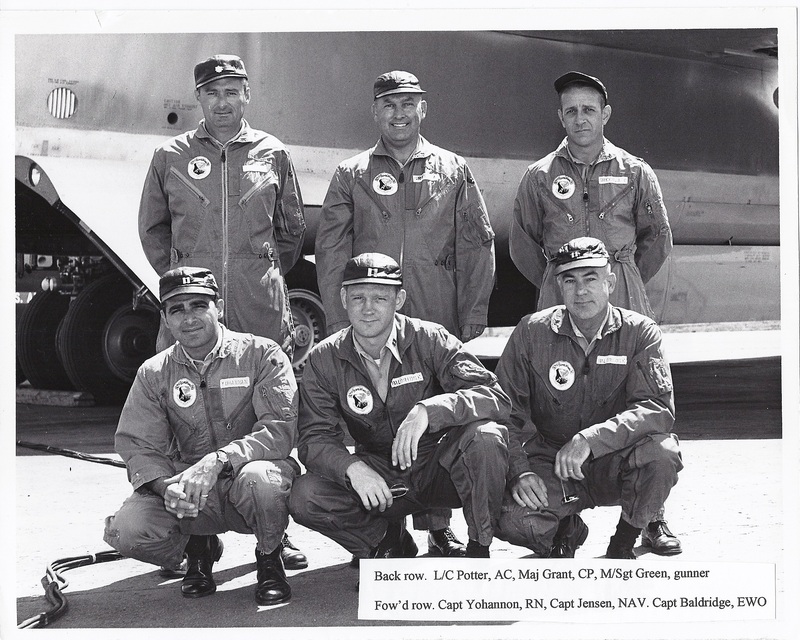 We soon got so that we could do it with out having an inadvertent disconnect, calling it a “one gulper.” With the KC-135s we refueled at altitudes of around 28-32,000 ft. and an airspeed of 255 kts.. This was a much better altitude and speed and our plane handled much smoother. One refueling would be at night, one shortly after daylight. Without our radar, we would have been very handicapped, probably would not have been able to locate the tanker at all. But it was a charm when things went well. The rendezvous was similar to that with the KC-97 in that we were assigned a time and altitude to be at the start refueling point. The tanker would arrive several minutes early and set up a race track pattern, from the start point back towards our inbound track. He would turn on his “transponder,” a radar signal that our radar set could pick up. When we were some 150-200 miles out (15-20 minutes) our radar operator would go into search mode. When our operator picked up the tanker, we’d make any course corrections needed to arrive at the start point on a given track. Radar would guide us in towards the tanker, long before we could see him visually. We’d make radio contact with the tanker, confirm he was waiting for us, and let him know how far out we were. On these missions we’d also let him know if we needed more fuel than the planned offload. When we were 25 miles out, he would make a turn and head back to the refueling start point, on the proper track. He would stay at refueling speeds, 255 kts. and we’d descend staying at our higher airspeed. We’d relay distances to him every 10 miles until we got down to the 4 mile point. At this time we were to be 1,000 feet lower than he and at an airspeed of 280 kts.. 3 miles, same altitude and 275 kts. At 2 miles we slowed to 265 and at one mile we were to be at 255. We’d have picked him up visually by the time we were at the 5 mile mark, or possibly earlier. We’d take it visually then, climb somewhat and come in and stabilize about a half plane’s length behind him. We’d then ease through the “bow wave” (a compression of the air behind the tanker, caused by two large aircraft being so close together. It was somewhat like a wall. Once through it, you’d pick up a knot or two of airspeed, so caution was necessary.) By now we could see the two lines of red-green lights on the bottom of the tanker. One line marked fwd-aft, the other marked up-dwn, and the boomer would also start talking you into position. We’d ease into position and the boomer would insert the boom. Our receptacle was in the top, behind where the two pilots were sitting, so we couldn’t see the action end of the boom. We learned to ease the power up a bit occasionally while in contact position, because of the increasing weight. The tanker would reduce power slightly, when we both did this correctly, our airspeed would hardly vary. Made both our jobs easier. On some of these missions we carried an extra pilot. We had a mattress on the floor behind the pilots, where we could sleep a bit. You had to keep your helmet on, because of all the air conditioning wind and noise. I could sleep a couple hours at a time and feel fairly well rested. When we had only two pilots, the electronics warfare officer would occupy one of the pilots seats when one pilot slept. He could help watch the instruments, and still do his monitoring. The observers downstairs would also stretch out on a mattress on the floor and sleep. The gunner in the rear had to sleep as best he could in his normal position. That was always a bit of a worry. If he were to lose his cabin pressure, he’d be dead in a few minutes. We had a remote reading gauge that showed his cabin pressure. When he slept, we watched that more often. I don’t think there was ever a problem with this. We also had radios we could tune in to commercial stations and pick up music, ball games etc. But the pilots had two radios plus interphone to monitor all the time. With these, I never felt I had time to listen to anything else except for very important news items, and then for only short periods. For eating, we had a small electric oven about one foot cube in size. We could plug that in and it’d really heat up. We also had a coffee heating cup to warm up the coffee from the jugs. I usually bought, (yes we had to buy our lunches) two frozen and one box lunch. The box lunch had two sandwiches (you could order your choice) two 1/2pts. of milk, an apple or an orange, a couple cookies, a boiled egg and usually some celery or carrot sticks. It wasn’t too bad, and always more that I could eat. I’d have that first, in the late afternoon. Then after the first refueling, I’d eat my first frozen meal. The EWO officer would come forward and heat them up for us and bring them to us to eat while we stayed in our seats. Then I’d have my frozen breakfast type after the second refueling, the next morning. This way you were eating about on schedule. During this time we had three squadrons here, all with about 22 crews and some 18-20 aircraft each. We kept nine aircraft airborne all the time. The aircraft would depart around 1030 or 1100 AM, and the incoming would arrive about an hour later. We would fly a mission on Monday, land Tuesday, be off duty Wednesday and Thursday, mission plan on Friday and take off again on Saturday. I think it was after four missions we were given ten days off. This was when we took care of our standardization duties. It was a busy time, but the testing portion went well and was considered a success. When the Cuban deal exploded, with Russia putting in missiles in Oct.1962, things really got interesting. We had all our planes loaded and on full alert. All Atlas and Titan missiles were also made ready and put on alert. Every plane had a crew assigned, who were also on alert. 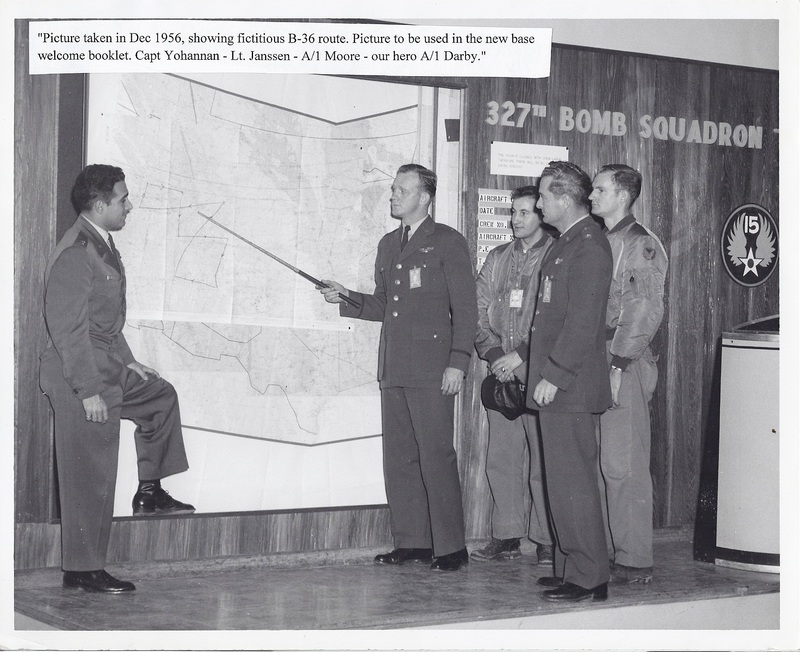 Each B-52 base had to keep three bombers in the air, on the route described above. During those “exciting” days, the crews were all on alert, or flying. No training going on, no leaves etc. Our take off times were about 1400. (2PM) The three primary aircraft would be readied. Two others would be readied as “spares.” The three primary would start engines, as would the number one spare. If for any reason one of the primary could not make his assigned take-off time, the spare would be used. We were spare one day, having just gotten down a day or two before, when one of the ships had a problem. Couldn’t get one engine to start or something else rather serious. Time was sneaking by, the command post kept asking the plane, “Gopher 11, is your problem fixed?” The answer was always “negative, but we’re working on it.” As take off time was very near, and we had our engines running all ready to go, I got on the radio and said “Gopher 23 has engines running, ready to go.” The command post quickly came back and told us to take the other plane’s place. We made the trip around again. This tension period lasted several weeks until our naval blockade showed it was working, the Russians ships were turned around. When flying these missions we had several different sets of targets all in Russia. When we were on our east coast we had one set, when we got up on top of the world another, and I think there were two more sets after that. If you were between this check point and the next when you received the message to attack, you would use the designated targets. We had been briefed on all of them, and had TOP SECRET information and maps along to be opened only after a correct message had been received. We had a different verification code for different days and times. We had a booklet, again in code from which you would decipher the code to insure the message was not a fake and was indeed real. When President Kennedy was shot, Nov. 22, 1963, we again went on full alert. Most of our planes were loaded for war, full bomb load, crews assigned and all. I don’t remember that we put any in the air for that period. One thing we always enjoyed while flying these missions was seeing the beautiful northern lights. That far north they would sometimes light up the entire portion of the visible sky. One time it was as if we were inside a large bowl, with the brilliant greens, blues, pinks etc. just dancing and pulsating all around and over us. Sometimes there would be a shimmering streak going horizontally across the northern sky for miles. You had to keep yourself from believing this was the actual horizon, since they often had quite a slant to them. Relying on our flight instruments kept the vertigo at bay. Could also be a distraction during refuelings. From my records I flew 40 of these missions with few exciting things happening. We aborted one mission on Oct. 12, 1962 because of “elevator” problems. 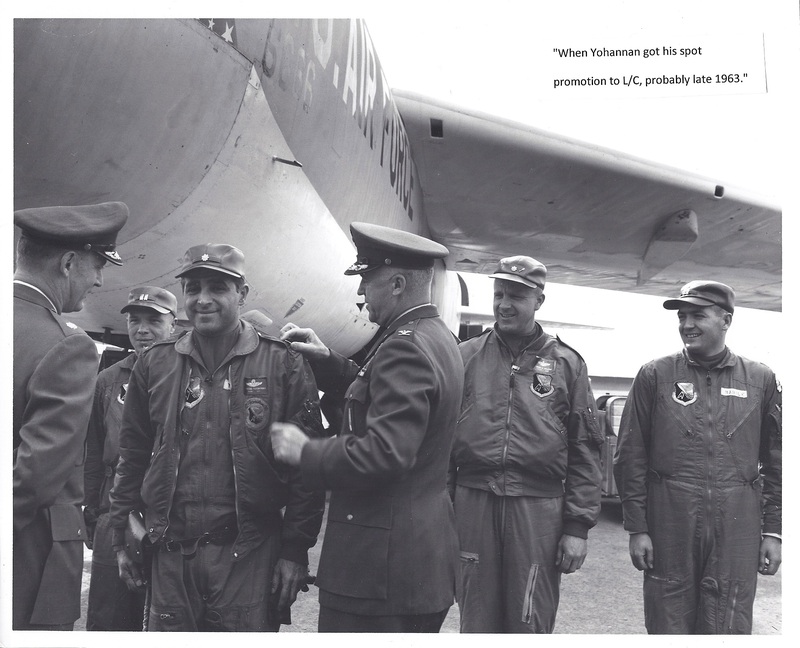 Also on Aug. 14, 1962 a returning aircraft had trouble getting its gear down. I flew in a T-33 to make an air check of the plane’s gear to see if they did have a problem. One night, about 2 AM we were well past Thule, Greenland. Sgt. Green using his “aldis” lamp ( a hand held spotlight, very bright) was doing one of his periodic “scans” of the tail and wing sections. He reported that we had a hole in the top of the left horizontal stabilizer. He described it as a square hole about 2 ft. wide and 2 ft. long. Being a square, I figured it was an inspection panel that had come loose, and not a hole resulting from something hitting us. I took the plane off auto-pilot and gently tried the controls. I could feel nothing abnormal. Our instructions were for us to report any problem immediately and land at the nearest suitable base if we had a “real problem.” But when you landed at another base with nuclear weapons on board, it was a real pain. Since the plane was handling like it should, I said ok, we won’t report it till later. So we continued on, met our tanker at Eilson in Alaska, and got our fuel. After another couple hours, when it was daylight, I called our command post and relayed we had lost this panel. We came on home and landed, no problem. On another mission, one of the ships in our cell called and told me they had lost their cabin heat and asked if I had any idea on what they might do. Again, we were way up north, somewhere just south of Thule. I said to let me think a minute. I opened the book with the diagrams of the different systems and looked over the air conditioning and heating plans. I noted there was a “sensor” in the floor of the upper deck, just behind the ladder. This sensor was covered with a piece of metal, with slots in it, to let the air circulate through it. I wondered if that might be the problem. So I called them back and asked if they had their extra bags stacked in this spot. Sure enough they said they did. I told them if they’d move those and clear those slots in the floor they might have heat. A few minutes later they called and were very appreciative. It had worked. They had heat. Always made you feel good to be able to do something like this. Another time, I was at home on base, when the command post called and said the CO wanted me to come up there. One of the planes was having a problem with one of their “drop tanks.” These external tanks carried fuel, and if you had one full and one empty, it caused quite a lateral control problem. By looking at the systems outlines I figured out a possible fix. We radioed it to them and about 15 minutes later, they said it had worked! So another big operation fades away and takes it’s place in history. Like the Berlin Airlift, there will never be another Chromedome type operation. For one thing we hope it will never be needed and with all the satellites spying on each other, we know more of what’s going on all over the globe. Also, there is no country in the world, we included that have enough aircraft to run this type of operation now. But for those of us involved, it was for real. We thought then and still do that it was a big factor in keeping world tensions from escalating past the point of no return. The entire globe would have been losers if that had happened. I hope we helped. Before I felt I could discuss this operation, I had to find out if it had been de-classified. Finding this out proved interesting. 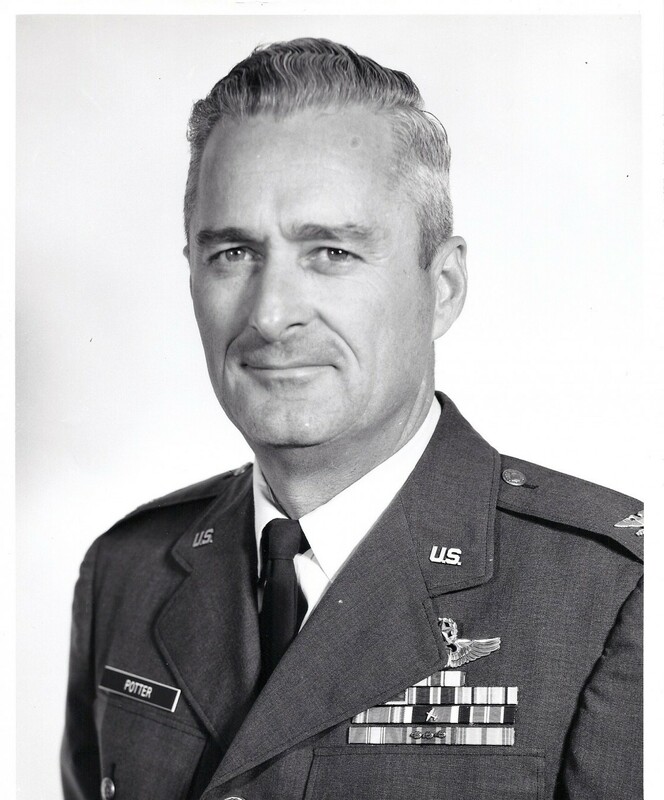 I started by contacting Major Balmer, Public Affairs Officer at Fairchild. She was unaware of the operation but was positive there was no information now on base concerning it. 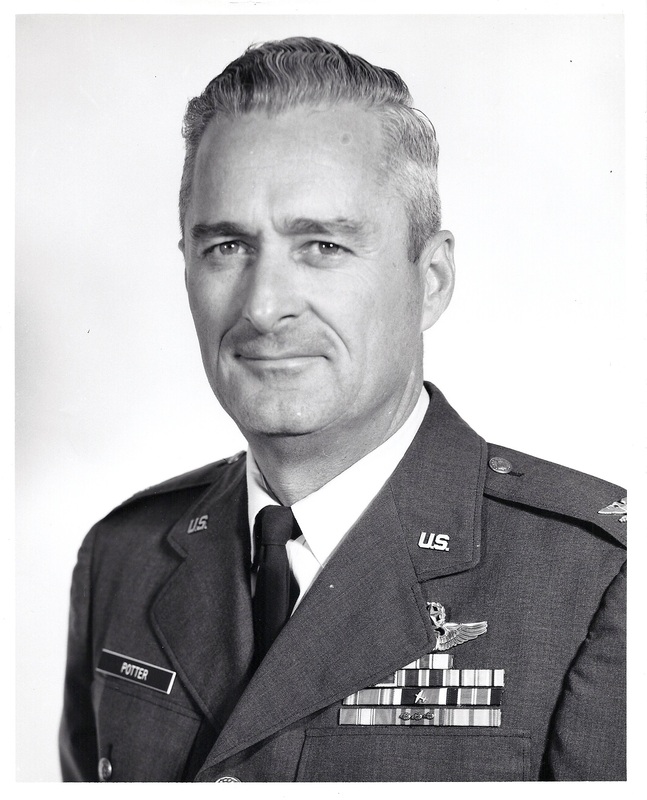 She suggested I contact Mr. Bob Clark who is in the Air Combat Command (the command that took over much of SAC’s duties) Historian’s office. Mr. Clark informed me there were no such records there, since “that was under SAC.” He gave me Mr. Grant Hales phone number and suggested I contact him. 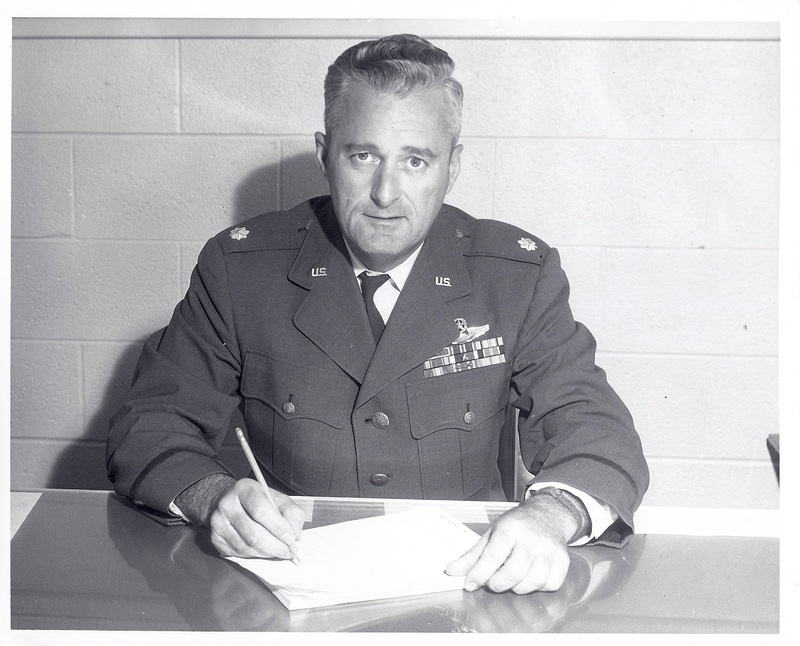 Mr. Hales is in the Air Force Command Historian’s Office at Langley, AFB. VA.
Mr. Hales listened to my request and said he’d have some information for me “in a few days.” True to his word, a couple of days later, he contacted me and said operation Chromedone had been de-classified in general. He said I could write anything I wanted about it, as long as I did not get specific. I could name the country that was targeted, but not an actual target. I could say we carried nuclear weapons, just don’t say how many. In substance, talk in generalities. This I have tried to do. Very interesting story. Nice to read about past times and the tension of the cold war. 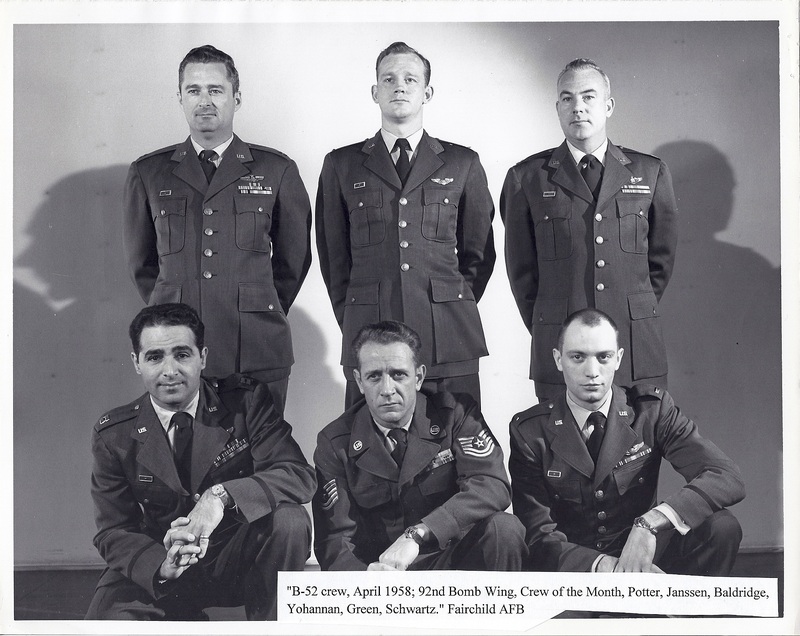 My Dad flew the KC-95 and -135’s. Loved the details…. thank you for sharing. I’m absolutely passionate abou Cold War and its planes and stories. Totally amazing.